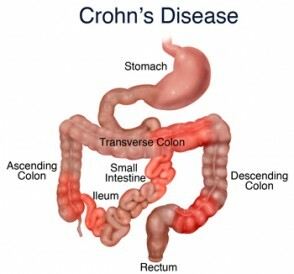 Crohn's disease (CD) is a condition wherein an individual experiences chronic inflammation of their digestive tract, which can cause damage to the area and much discomfort. It is the unfortunate truth that the definite cause of this condition has not yet to be ascertained. Thankfully, there are numerous Crohn's disease medications, which prove useful for those suffering from this condition. Common symptoms associated with this condition include diarrhea, cramping, bleeding, abdominal pain, and/or weight loss. These symptoms can vary from persontoperson, and can be intense at times, and non-existent at others. The following medications have proved helpful in treating the condition, and lessening the frequency and intensity of symptoms. Medications: This medication is often prescribed for mild to moderate cases of Crohn's disease, which works to reduce inflammation. It can be taken either orally or as a suppository. Medications falling under this category include Sulfasalazine, mesalamine, olsalazine, and balsalazide. Side Effects: As with most medication, these medications also have some side effects, including nausea, vomiting, headache, heart burn, and diarrhea. In some cases, individuals have experienced decreased levels of whit blood cells when taking this type of medication, as well as kidney problems. Your doctor will likely monitor you to ensure that no adverse and potentially dangerous side effects occur or exacerbate. Consult with your doctor before stopping any course of prescribed medication. Medications: This Crohn's disease medication also works to reduce bodily inflammation, and can provide an individual with short-term relief from symptoms associated with CD. Medications of this type include budesonide, which is used for mild cases of CD; prednisone; and methylprednisolone, which is offered to individuals when budesonide is ineffective. Side Effects: Some side effects associated with these medications include high blood pressure, weight gain, swelling, and/or glaucoma. If these medications are taken for longer than three months, more serious side effects may occur. These include reduced bone density, and liver complications. Medications: Some researches suggest that CD may be caused by a dysfunction of the immune system, whereby the cells of the immune system mistakenly attack the GI tract (gastrointestinal tract). For this reason, treatment may include Immunomodulators and immunosupressives (such as azathioprine, cyclosporine, mercaptopurine, and methotrexate), if the previous two kinds of medications listed above have proven ineffective, or if the development of fistulas are evident. Side Effects: Side effects pertaining to this treatment include nausea, vomiting, headache, and diarrhea. This medication may also cause adverse effects on the immune system, effecting how well one's body fights disease and infection. Medications: This type of IV (intravenous) medication works to target specific area and reduce inflammation, usually administered to target one's intestinal lining. Medications of this type include adalimumab, certolizumab pegol, infliximab, and natalizumab. Side Effects: Since this type of medication is administered intravenously, you may experience irritation, redness, or swelling at the site of injection. Other side effects you may experience include fever, chills, headaches, and/or low blood pressure. In rare cases, some individuals have developed tuberculosis, or other serious infections. Let your doctor know of your medical history (if they do not know it) before taking any prescribed medications. Blood thinners, as some individuals with CD are at an increased risk of having blood clots. One may also be more susceptible to other conditions affecting the blood, such as anemia. If you are believed to have anemia, you will likely be prescribed shots of vitamin B12, as well as iron supplements. One's eating habits can help to ease the occurrences of CD, although there is no evidence to suggest any specific diet can cure the condition. If one can keep a diary listing what food they have eaten, then they would be able to ascertain what foods may instigate symptoms related to Crohn's disease, and avoid such foods in the future. Dairy may be an instigator of this condition, particularly for those who are intolerant to lactose. Fish oil is thought to reduce the likelihood of a relapse. Those with CD may experience deficiencies in vitamins A, B, D, E, and K. For this reason, supplements, or increased consumption in foods rich in these vitamins may be required. Other factors, such as stress, can worsen one's condition, meaning that taking time to relax may help with Crohn's disease, in correlation with Crohn's disease medication. Those who smoke should also quit, as smoking can have an incredibly detrimental effect on CD. Acupuncture. This is thought to treat inflammation. First used in China, it is becoming more popular in western regions. Herbs. A common herbal remedy used to treat CD is Boswella, which is though to work in the same way as mesalazine, with less negative side effects. Colectomy – During this procedure, a surgeon will extract the disease section of one's colon, and reconnect the remaining tissue. Strictureplasty – A surgeon will dislodge sections of the bowel that have become blocked.